Enjoy exclusive use of the caboose for your private party! Climb up into the cupola for a bird's-eye view of the train as it rolls through Niles Canyon, along the scenic route of North America's First Transcontinental Railroad, with a docent aboard to tell you about the railroad. 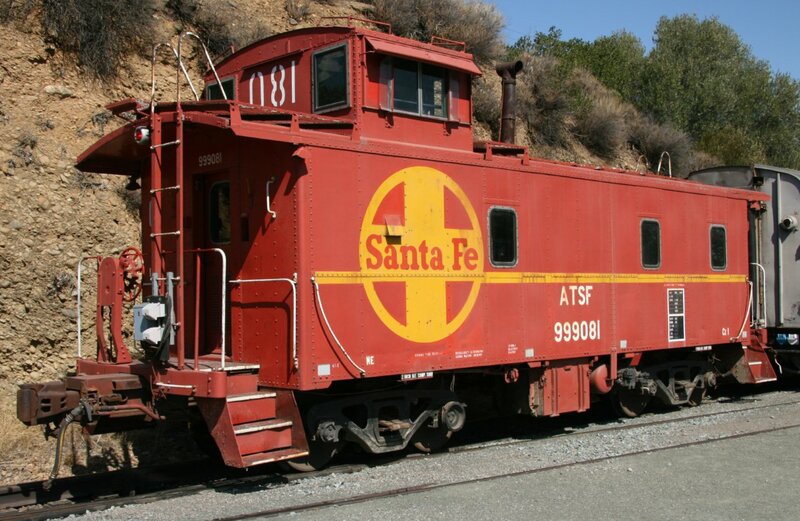 Our Santa Fe cabooses provide a special ride for groups of up to 24 people (depending on whether they are adult-sized or child-sized). Two small serving tables are available on-board for serving your refreshments. There are windows on the main floor, but the best view of the train is from the seats high up in the cupola. You may bring your own food and drinks aboard the caboose to enjoy. Your reservation also includes the use of three picnic tables at Sunol Community Park across Kilkare Road from our depot before or after your caboose ride. Caboose charters are only available on regular weekend trains departing from Sunol. The reservation fee is $75 (regardless of the number of riders) plus the regular fare for each person. Come to the Sunol ticket window to get your special caboose tickets before your ride. The caboose is very popular, so reserve early!